Mica, Titanium Dioxide, Zinc Oxide, Lauroyl Lysine, Zinc Stearate, Ethylhexyl Palmitate, Silica, Water, Glycerin, Aloe Barbadensis Leaf Extract, Carica Papaya Fruit Extract, Punica Granatum Extract, Vitis Vinifera Grape Seed Extract, Chamomilla Recutita Matricaria Flower Extract, Camellia Oleifera Leaf Extract, Camellia Sinensis Leaf Extract, Rosa Canina Flower Extract, Olea Europaea Olive Fruit Extract, Palmitoyl Oligopeptide, Palmitoyl Tetrapeptide-7, Tocopherol, Ascorbyl Palmitate, Hydrolyzed Collagen, Silk Powder, Niacinamide, Retinyl Palmitate, Silica Dimethyl Silylate, Hyaluronic Acid, Cholesteryl Oleyl Carbonate, Cholesteryl Nonanoate, Cholesteryl Chloride, Butylene Glycol, Phenoxyethanol, Carbomer, Polysorbate 20. May contain: Iron Oxides. This foundation is medium to full coverage. It really brightens my skin up and evens it out beautifully. It does not look cakey, and lasts all day. It is pricey, and does not cover darker scars as well. 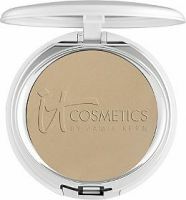 But it does not break me out and provides a nice even coverage that does not look like makeup.